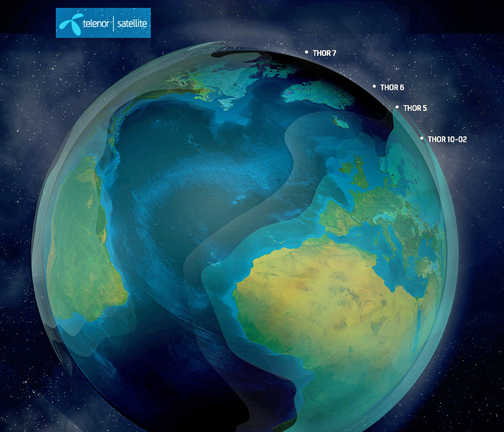 The first Ka-band satellite for Telenor Satellite is the THOR 7, which provides regional SATCOM coverage over the main European shipping lanes. Due to the satellite's capabilities—especially over the Mediterranean—Marel Electronics, in partnership with Hellenic Seaways, Telenor's THOR 7 has been selected for connectivity services on board their entire Hellenic Seaways fleet of ferries. Hellenic Seaways, which operates domestic ferry services throughout the Greek islands with ships carrying up to 2,000 passengers, will now be able to offer WiFi to all passengers using the high-bandwidth capacity from Telenor to ensure reliable and always-on connections. Hellenic Seaways was previously a THOR 7 beta-test customer and has been using the service effectively on Nissos Mykonos. Equipment is now being installed to mobilize the rest of the fleet. Julian Crudge, Divisional Director at Telenor Satellite, offered that due to THOR 7's high-powered capacity throughout the Mediterranean, the SATCOM solution for ferries that require reliable high speed regional connectivity is ideal.